The weather of late is calling more for salads than soup. We know of course that’s going to change. This salad is like a bridge — or maybe a hybrid (hybridge?). It marries tastes of the season — smoked salmon anyone? 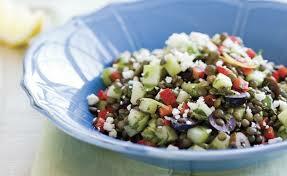 — hardy fare — lentils, after all — with light treatment in a wonderful Asian-inspired dressing. It seems an unlikely combination but don’t be fooled. You’ll enjoy it for lunch or as a dinner with soup (when the inevitable chill comes back) and crusty bread. The original recipe is from Fine Cooking. Whisk garlic, shallot, vinegar, ginger, mustard, fennel seed, 1½ tsp. salt, and ¼ tsp. pepper. Whisk in the oil. In a large bowl, toss the lentils, radishes, fennel, fennel fronds, and chives with just enough of the vinaigrette to coat everything lightly. Season to taste with salt and pepper. (You can prepare the salad to this point up to 4 hours ahead.) Just before serving, gently stir in the salmon and a few grinds of pepper. Garnish with parsley. Packed with flavor and protein, this soup is a meal unto itself — just add crusty bread and a fruity cobbler for dessert and you’ll be feasting on comfort food at its best — and so so healthy! You’ll be ready to run a marathon the next morning — especially if you repeat for breakfast. This is from from “Super Natural Every Day,” by Heidi Swanson, which you might want to consider putting under the tree of your favorite cook (you know who that is). It was adapted by Danielle for a cooking class at Brookside November 18 2015. Heat the oil in a large soup pot over medium-high heat. Stir in the onions and sweet potato. Add a big pinch of salt and sauté until the onions soften a bit, a couple of minutes. Add the curry powder; stir until onions and sweet potatoes are coated and the curry is fragrant, a minute or so. Add the farro, lentils and 6 cups of the broth. Bring to a boil, lower heat, and simmer, covered, for 40-50 minutes. Taste and season with more salt, if needed. (Don’t under-salt or the soup will taste flat.) While the soup is cooking, in a small bowl, stir together the yogurt, lemon zest and juice, and 1/4 teaspoon salt. Serve each bowl of soup topped with a dollop of lemon yogurt and a drizzle of olive oil. Serves 8-10.